← A Fourth of July Giveaway! Happy Leftovers Club Day! Today I am sharing a recipe for my all-time favorite cookie. It’s a big day. Not only do I get to share these with you, but I also get to watch my cousin get married tonight. I figured that these cookies would be perfect to celebrate, as she’s the reason I eat so many of them every summer. Why just the summer? 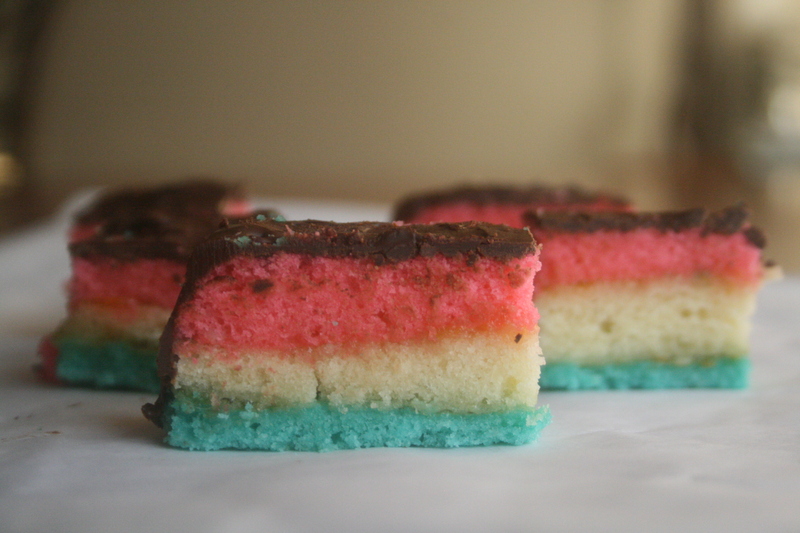 Well, these Rainbow Cookies are made in bakeries and delis across Long Island, where I was born and have spent almost every summer since visiting. My Aunt Noreen makes sure the house is stocked with my favorite New York-only treats…and that my cousins and I have plans each day so we do not become giantic from eating them all. 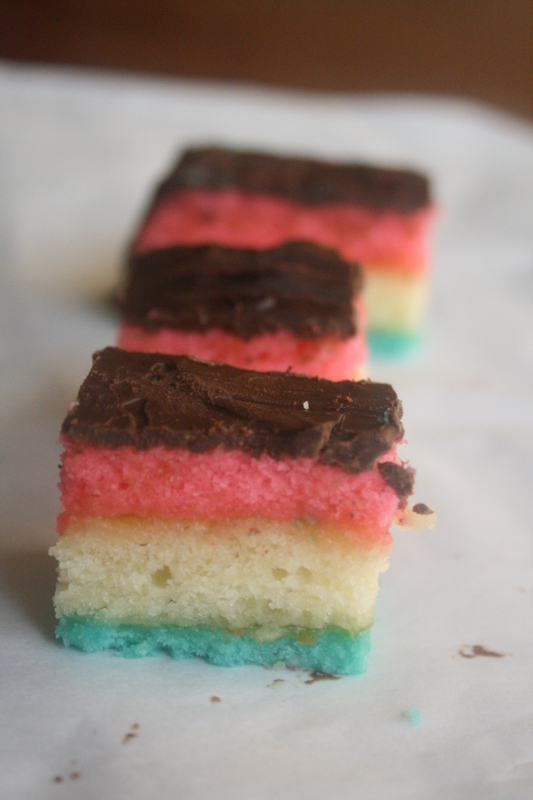 Rainbow cookies are traditionally pink, green and yellow, but I put a little spin on them because of yesterday’s holiday. They take several hours to complete, but the payoff is worth it. While doing research on how to make the best version of them, I discovered that this unique dessert requires an unusual ingredient – almond paste. I had never heard of it before so do not worry if you haven’t either. Almond paste is sold at most stores in the baking section and is also incredibly easy to make from scratch. Once you make the dough with the paste, it is hard to stop eating it before you put it in the oven. I mean, what? That totally didn’t happen. 2. Combine almond paste and 3/4 cup of the sugar in a mixer. The dough will be crumbly. Add in butter and egg yolks until the batter begins to be creamy and smooth. Add in the flour and mix until it is well incorporated into the dough. 3. In a small bowl, mix together egg whites and the remaining sugar until they start to fluff. Add this to the batter. 4. Divide the batter evenly into three bowls. Mix drops of red food coloring into the first bowl until the batter is a dark pink color. In another bowl, do the same thing with the blue food coloring until you reach the desired shade you want. Leave the third bowl as it is. 5. Cover a rimmed 9 x 13 baking sheet with parchment paper. Pour one bowl of batter onto the parchment paper and smooth out with a spatula until it covers the entire surface of the pan and the layer is smooth. Bake for 10 minutes. Repeat this step with the two other colors. Let each one cool completely. 6. Now it is time to make the layered cake. Spread a thin layer of apricot jam onto the top of the blue cake layer. This is to keep the layers stuck together. Make sure you distribute it thinly, or the jam will ultimately make the layers slide all over the place. Trust me. I know from experience. Top the blue layer with the white layer and top that with jam as well. Carefully place the red layer on top and gently press on the cakes to make sure the jam sticks to each of the sides of cake. Place your layered cake in the freezer for two hours. 7. Place the cake onto a large cutting board. Heat your chocolate in a small microwave-safe bowl in 45 second increments, stirring after each time. When the chocolate is smooth, pour directly onto the top of cake. Using a spatula, spread the chocolate evenly onto the top and all 4 sides of the cake. Take a fork and gently press lines into the top of the chocolate. 8. Let the cake sit for a few minutes so that the chocolate hardens. If you notice that it isn’t hardening, place the cake in the fridge for a few minutes. It is imperative that the chocolate hardens, but do NOT leave it in the fridge too long because if the chocolate is too hard it will be hard to cut without the chocolate slipping off the cake. 9. Cut the cake by cutting it into lines. Then carefully cut those lines into inch long pieces. Store in an airtight container. Interested in what all of my friends made this month? Here’s links to all of their posts. Check them out! 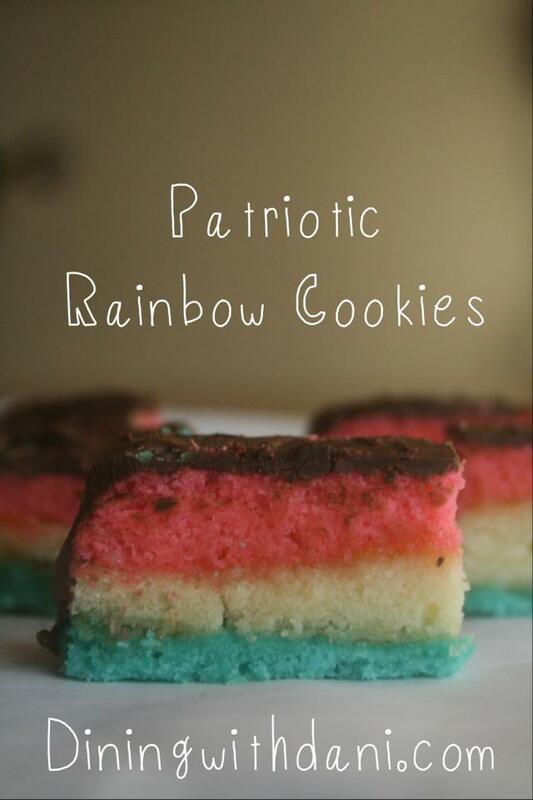 This entry was posted in Desserts and tagged 4th of july, advanced recipes, bakery, cookies, dessert. Bookmark the permalink. I had never had rainbow cookies before!! Thank you so much for sending me such an awesome treat! These were moist and delicious– I basically had to fight my kids for them. I’m gonna try to make these at home sometime soon– fingers crossed for almond paste! I made my own almond paste. It was so easy! Just almonds, egg whites and powdered sugar! These are SO gorgeous! I can’t wait to try them! 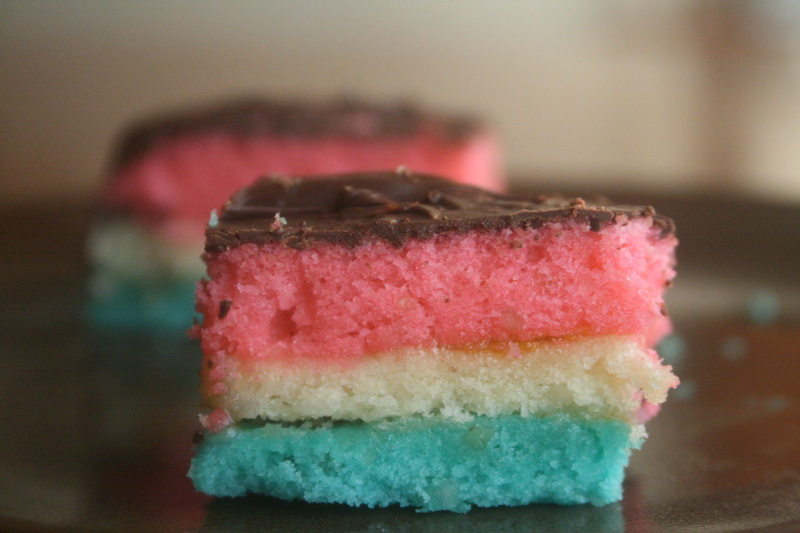 These cookies (rainbow or “tri-color”) are one of my favorite things on earth. My family and I love them! I’ve always thought about trying different colors and yours turned out so nicely! Looks delicious, too! : ) Almond paste is a favorite baking ingredient of mine.